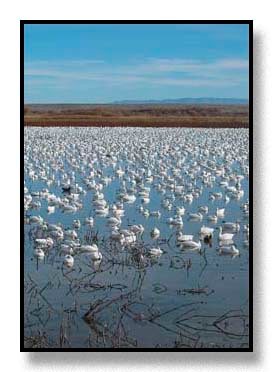 Snow geese at the Bosque del Apache National Wildlife Refuge, NM. This photo was taken during the weekend of the 2002 Festival of the Cranes. This photo was taken at lunchtime, when the geese come in to take a midday nap. The panorama consists of 11 images (180°), with a printed size of ca. 4" x 34". It can be printed at other sizes by request.